Cardio and strength workout programs are very effective to burn fat and get a toned, slim body but many people do not want to work out. Fortunately, when it comes to weight loss it is your diet that really matters. A bit change in your lifestyle and a low carb diet plan will take you closer to your goal. Drink more water and have a good enough sleeping to regulate your metabolism. Include in your diet large amounts of protein and fibers, vegetables, fruits to give you the fuller feeling and decrease hunger feeling. Being in a caloric deficit is a tough experience for many people. 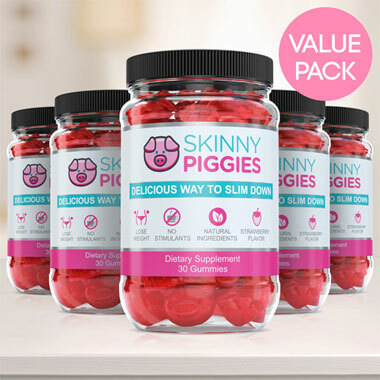 Skinny Piggies gummy supplement will help you to curb your hunger and feel fuller so that you consume fewer calories. You can take one gummy 30 minutes before each meal. How Good Are Fiber Gummies? Do you love snacking on tasty treats but also want to slim down? Now, you'll be able to support your weight-loss diet by indulging in novel appetite suppressant gummy supplements called Skinny Piggies. 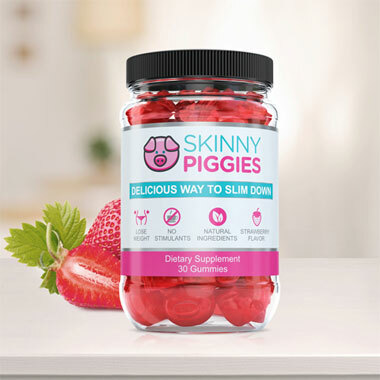 Skinny Piggies are yummy all-natural diet gummies that help stop cravings and hunger while enabling your body to remain in fat-burning mode. Losing fat is not hard to understand: Take in less calories than your body uses daily and you'll drop weight, no question about it! But when you start cutting back calories, and hunger and appetite become difficult to manage. That's where Skinny Piggies Diet Gummies can help! These tasty appetite suppressant supplements are formulated to not only help you fulfill those cravings, but also help you to stick to your diet by helping you reduce your hunger. Hunger is primarily controlled in: energy consumption and the stretch in the stomach. When you eat food, your stomach gets full and your stomach expands. That makes you feel satisfied and you stop eating. When you add Skinny Piggy gummies to your diet, you trick your stomach into feeling fuller. Chewing a Skinny Piggy with a 16-ounce glass of water a half hour before eating dinner will cause it to expand in your stomach so that it takes up space and gives you the sensation of having eaten a substantial meal. That means you can lessen appetite and hunger, food cravings, and keep your caloric intake down, without being hungry all day. The soft gel enables your stomach to empty gradually leaving you feel satisfied a lot longer. The longer you feel satisfied, the less likely you will continue eating that enables you to reach a lower caloric intake. As the liquid gel surrounds the food, it delays the digestion of sugars and that flattens your level of glucose in your blood. By preventing spikes in your blood sugar you prevent those strong cravings. Avoiding blood glucose spikes helps prevent your meals from getting stored as unwanted fat. By keeping you in fat-burning mode, our slimming gummies help you lose weight. How do Skinny Piggies Compare to other Weight-Loss Pills? There's no limit to the choices of diet pills on the market today. From diet supplements to appetite suppressants, it's impossible to find out what fat loss supplement is right for you. 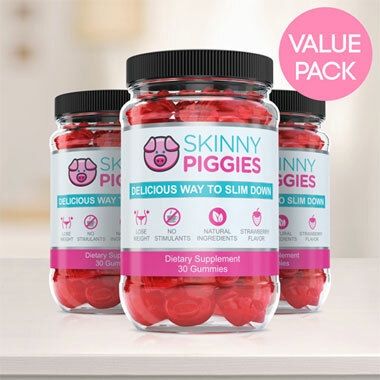 Sifting through the research on each product is a time consuming task, but Skinny Piggies stand out among the rest for the following reasons. Skinny Piggies contain absolutely zero chemical additives: you can actually read and pronounce all of the key ingredients. The nutritious, all natural ingredients in Skinny Piggies also have further healthy benefits such as support for healthy looking skin, healthy looking nails and hair, and anti-aging properties. On top, Skinny Piggies have no stimulants. This is a vital fact to consider because if you consume caffeine, not only you will be suffering from burnout and fatigue afterwards, but it limits when you can consume them. Take a stimulant based fat burner too close to bed time and you won't be able to sleep that night. With Skinny Piggies, you can take them even before going to bed without a problem. There are no limitations with this product. Finally, what other diet product is as tasty as a strawberry gummy? 'Thought so! Losing weight can be a challenge, but our delicious gummies are here to help you make it easier on you. You'll love the fruit taste of our slimming gummies, so forgetting to take them every day will be easy. Skinny Piggies are dietary supplements that can help you too.